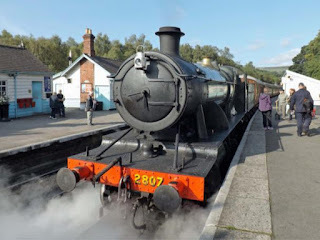 With 2807 in Yorkshire, you might think that there was very little to do at Toddington. 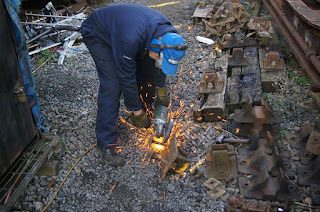 However, boot scraper production has to continue! John G spent the entire day painting rail chairs and brushes for them. The only positive thing you can say about the boot scraper production facility (i.e. a 20ft shipping container) is that it’s dry! In fairness, we did let him out on a couple of occasions. Bruce and I decided that needle-gunning just outside the contained was not good. 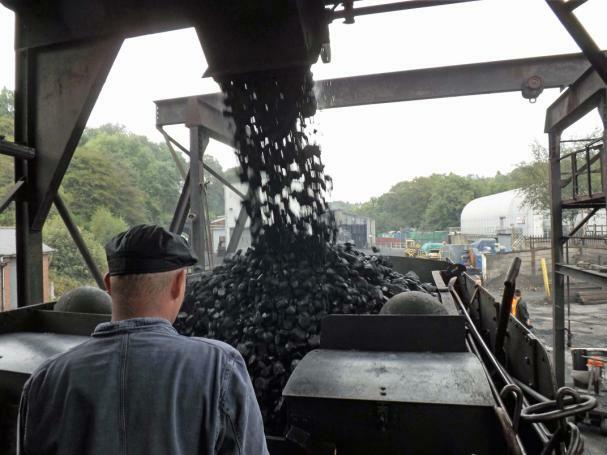 The noise bounces off the loco shed, the diesel shed and the row of containers, making it very unpleasant as a work area. Furthermore, Joe Public might be standing just round the corner, trying to read the display boards that give information about some of the locos. We hit on the idea of throwing away an ancient welder and using its cabinet to house the compressor. We had used it in the distant past, but more modern equipment has really rendered this 3-phase device obsolete. Guess where it is [was]? Just outside the TPO! This is where our boot scraper production used to take place, and the noise is kept well away from other workers and the public. 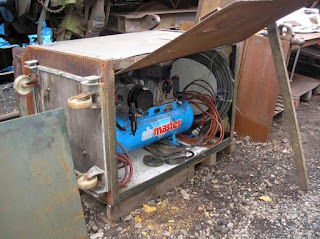 So, we heaved the old transformer out and wheeled it down to the skip. JC was passing by with the fork-lift, and kindly deposited the transformer in the skip. 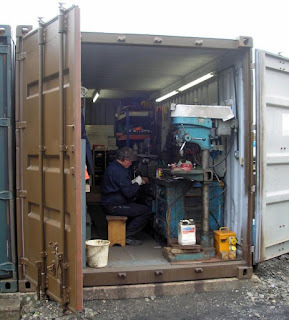 Bruce & I played with the cabinet; made a level base for it; tipped it over (to suit the shape of the compressor), and then (with assistance from John G on one of his outings from the container) moved the compressor from container to cabinet. A test showed that it worked fine, there. It’s not perfect - you have to fling the mains cable across between a couple of wagons to reach the power source, which is shared with two more containers! The door opens upwards and its hinges are pretty pathetic! These really need replacing with more substantial ones. Nevertheless, it works! Coaling stage at Grosmont and 2807 at Grosmont - photos from Andy Bryne. Pickering and is booked for the 17.15 return from Grosmont.